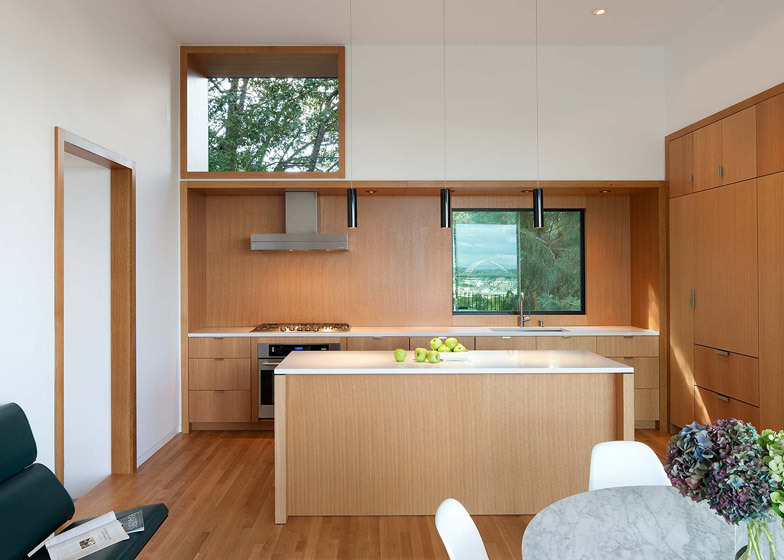 Faced with a sharply sloping plot in Portland, Oregon, architect Ben Waechter chose to "build up rather than out" to create a cost-efficient house for a family (+ slideshow). 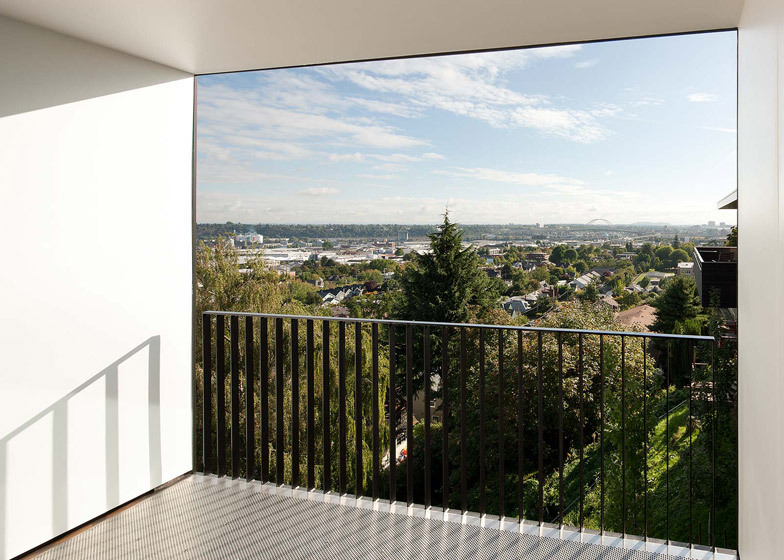 The four-storey Tower House was constructed on a site that had previously been called "unbuildable" due to its constrained position between a ravine and another house. To get around this, Waechter developed a building with a footprint of just over 50 square metres. "Our solution was to build up rather than out," Waechter explained. 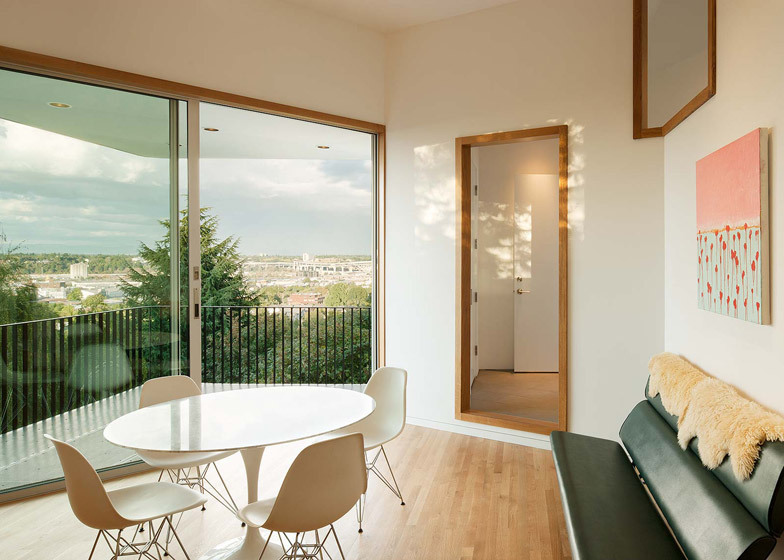 "We designed a tower house that touches the ground lightly to reduce foundation costs, fits within the narrow lot constraints and minimises the environmental impact to the remaining site." Three out of the four floors are mostly taken up by just one room, ensuring that the interior appears spacious rather than cramped. The master bedroom occupies the lowest level, while the two uppermost floors accommodate the living room and a combined kitchen and dining room. "These are the dominant rooms of the house," said Waechter. 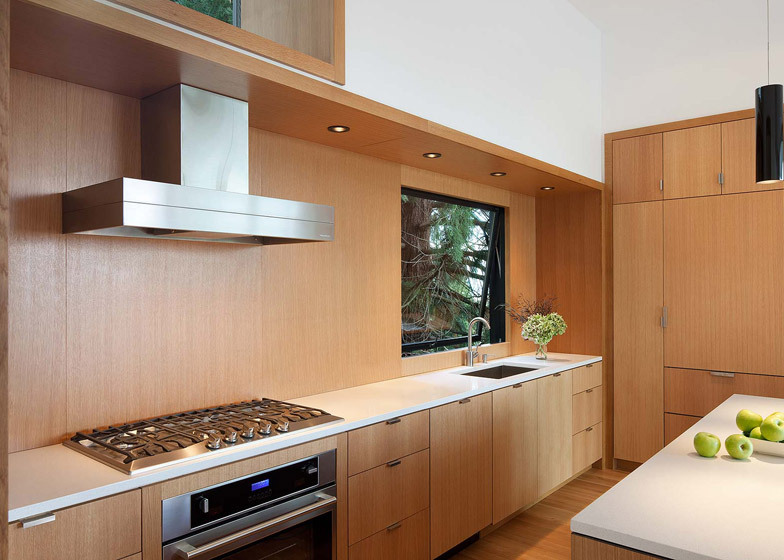 "They are tall, generous volumes of space finished with oil-rubbed quarter-sawn white oak. They are simple, quiet rooms that feel protected yet open." 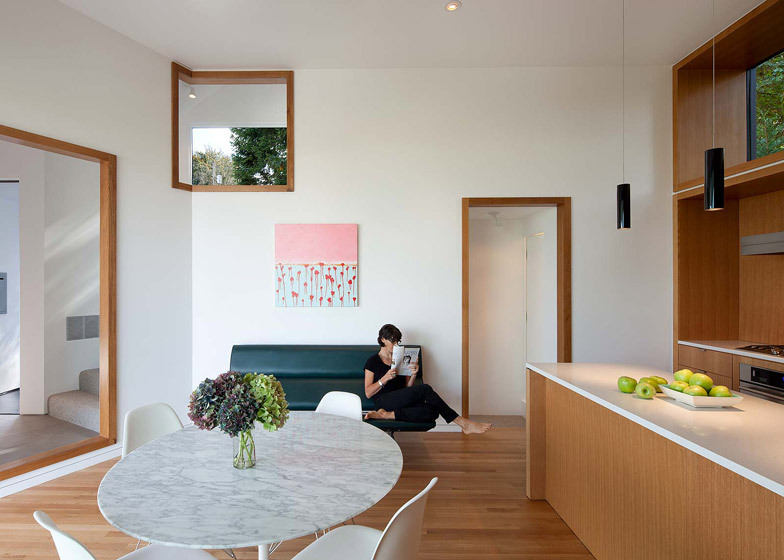 "The white oak palette is limited to these spaces, creating a strong threshold between the inside of the room and out, and heightening one's sense of being held and contained," he added. The house's entrance is a bridge that leads directly onto the second floor, compensating for the two-storey level change between the base of the building and the adjacent street. 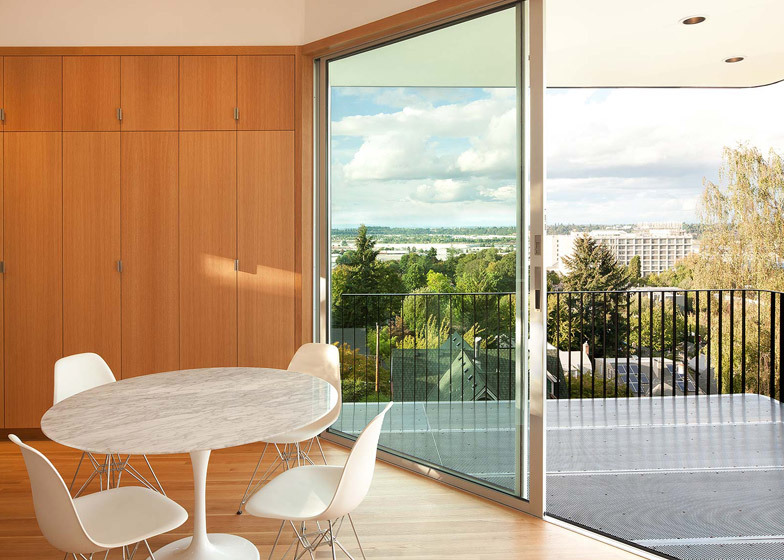 Beyond a recessed porch, a compact lobby provides a buffer between the entrance and the dining room – a space that opens out to a large sheltered balcony at the north-east corner of the building. 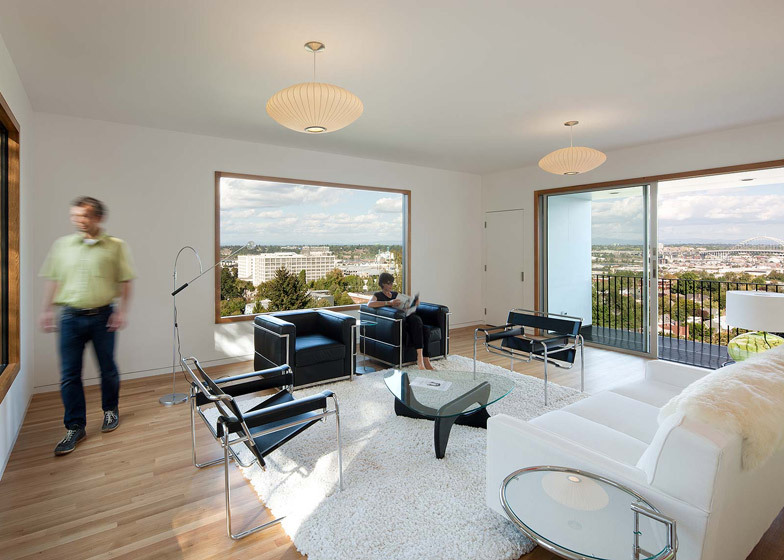 The living room above also opens out to a recessed balcony, while the ground-floor bedroom features a sheltered terrace on one side. "These rooms have an intimate scale with a sense of being tucked away, hidden and private," said the architect. 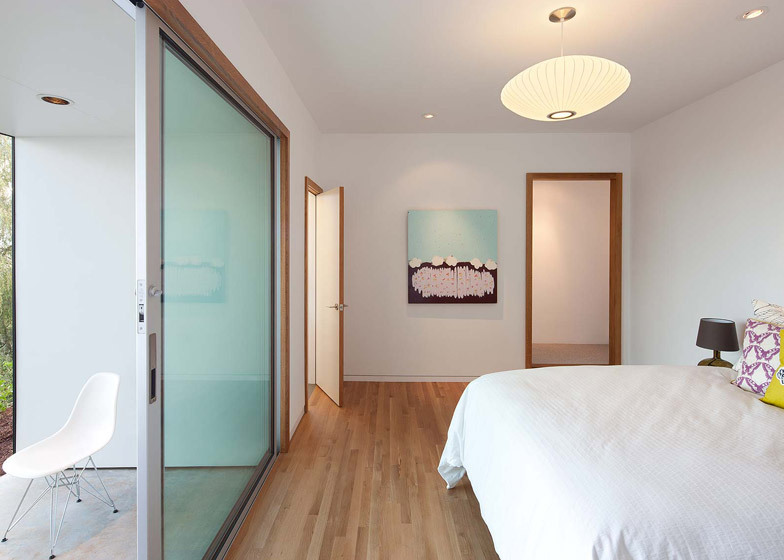 Two extra bedrooms are located on the first floor, and both the bedroom floors include bathrooms. 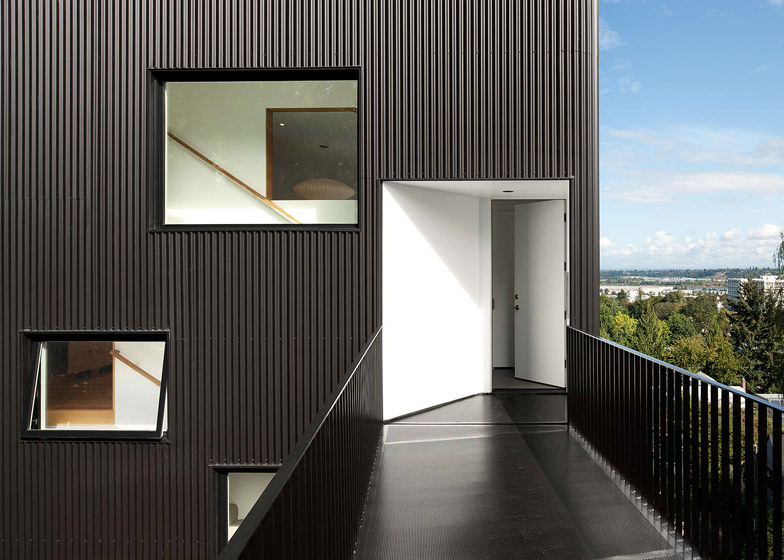 Externally, the building is clad with black corrugated steel that creates vertical stripes, exaggerating the height. This material curves around each of the corners, meaning there was no need to add a corner trim. Photography is by Lara Swimmer.